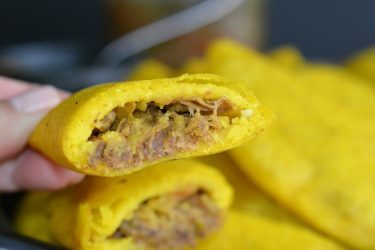 A pastel de pollo is simply an Colombian chicken empanada but with a round shape. Nothing more, nothing less. The pasteles tend to be bigger but I make them small so I don't have any issues trying to seal them shut because otherwise, they crack. 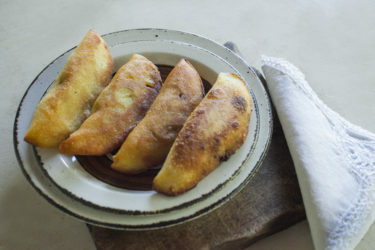 And if you want, you can fill them with this recipe's filling or with the fillings I used for the chicken empanadas and beef empanadas recipes on my blog. 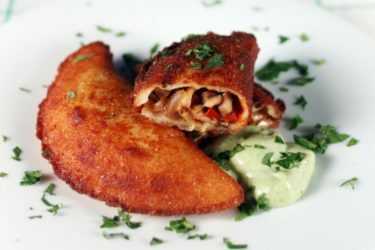 You will want to serve them with either Colombian hot sauce, Colombian green hot sauce or guacamole. To assemble the turnovers, make small balls of masa of about 1 inch in diameter. You will need 2 small balls per turnover. Cover a tortilla press with plastic, place a small ball in the center and press to make a disc, put it aside and do the same with the second small ball. Fill one of the discs with about 1-2 tablespoons of filling, leaving a border of about ½ inch. Place the second disc on top of the filling. Press the borders with your fingers to seal it and then crimp the edge with your thumb. Continue this process until you are done assembling all the turnovers. To avoid getting cracks in your turnovers, deep-fry them as soon as you assemble them so the dough doesn't dry out.